El Alamein: Outfoxing the "Desert Fox"
The 9th Australian Division played a pivotal role in British 8th Army’s battles from July and November 1942 to halt the German and Italian advance towards the Nile and then to decisively defeat and force them to retreat. After a lull in the desert fighting, Field Marshal Erwin Rommel launched an offensive on 26 May 1942 with the objective of capturing Tobruk which surrendered less than a month later on 21 June. 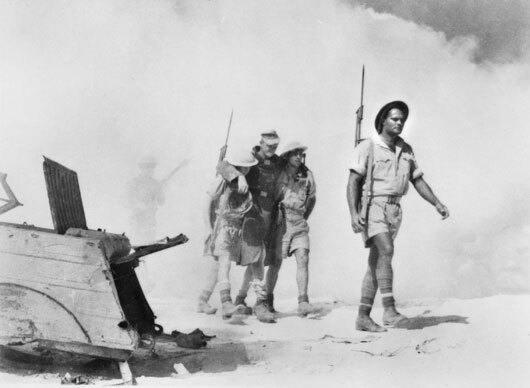 The British and Commonwealth forces retreated back across the Egyptian frontier, first to Mersa Matruh and then to El Alamein where a defensive position had been established between the coast and the impassable Qattara Depression. On the first three days of July, Rommel attacked what was known as the Alamein Box but the 8th Army won the preliminary phase of the battle. Next day, 4 July, the advance guard of the 9th Australian Division, commanded by Lieutenant General Sir Leslie Morshead arrived at the battlefront from Syria. It was soon followed by the rest of the division. On 10 July, the 9th Division attacked in the north and established itself on Tel el Eisa Ridge. Rommel attacked in the south the same day and for the next three weeks both the British including the 9th Division and the Germans and Italians launched a series of attacks with the British unable to drive Rommel’s forces from Alamein and Rommel being unable to break through to the Nile. Rommel made his last attempt to break through on 30 August at Alam Halfa but strong British defences forced him to go on the defensive. In August General Alexander was appointed British Commander of Chief in the Middle East and General Montgomery was given command of the 8th Army. The second Battle of El Alamein began on 23 October 1942, with 220,000 Allied troops, 1100 tanks and 900 guns pitted against 180,000 German and Italian soldiers, 600 tanks and 500 guns. ‘Operation Lightfoot’ called for infantry from Australia, Britain, South Africa and New Zealand to attack along a 14 kilometre front to clear the way for an armoured advance. The opening assault continued for two days but failed to produce corridors through the minefields to allow an armoured breakthrough. The 9th Division at the northern end of the line was ordered to begin attacking northwards towards the sea and for a week most of the infantry action was undertaken by the Australians. The Australians bought the Allies the time they needed, drawing enemy forces north and unbalancing them. On 2 November 1942, New Zealand and British troops, backed up by British armoured brigades, launched ‘Operation Supercharge’. The operation proved very difficult, with Allied troops suffering heavy losses before finally breaking through the German lines. By late afternoon on 4 November 1942, the enemy was in full retreat. 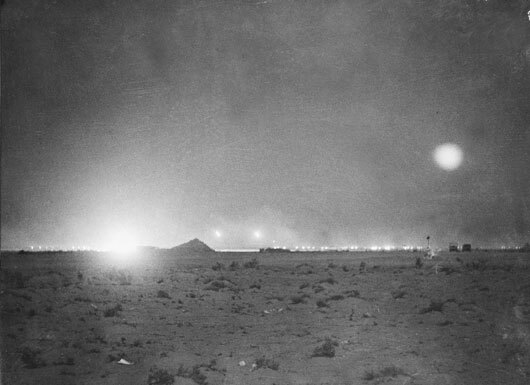 The Allied victory at El Alamein presaged the surrender of the Germans in North Africa in May 1943. 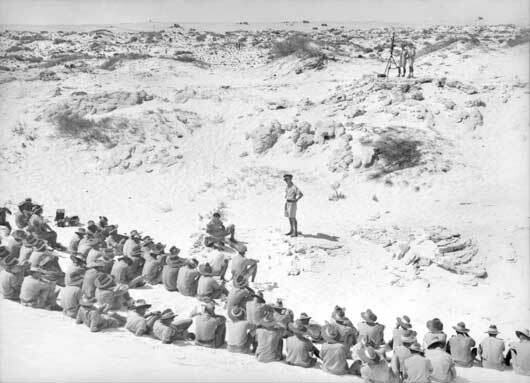 El Alamein was the 9th Division’s last battle in the Middle East before returning to Australia to face the Japanese in the South West Pacific. The RAAF including No. 3 and No. 459 RAAF Squadrons as well as many RAAF personnel serving in RAF squadrons played a important role supporting the 8th Army in the battles at El Alamein and in the pursuit of the retreating Germans and Italians. 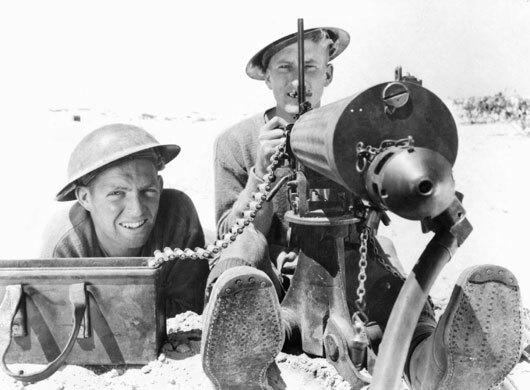 A group of soldiers in the Western Desert, shortly after the great Battle of El Alamein (AWM 013352). A machine gun and its crew in the Western Desert (AWM 013660). 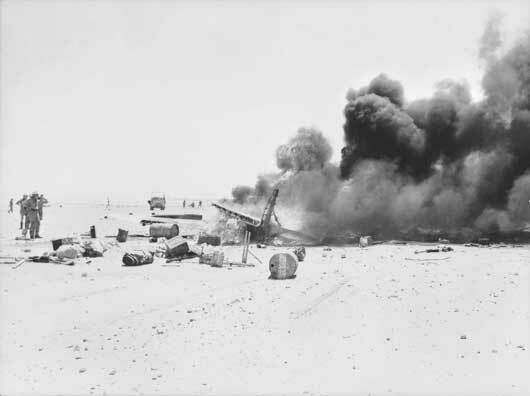 A Hurricane fighter aircraft shot down near El Alamein, bursting into flames (AWM 024475). 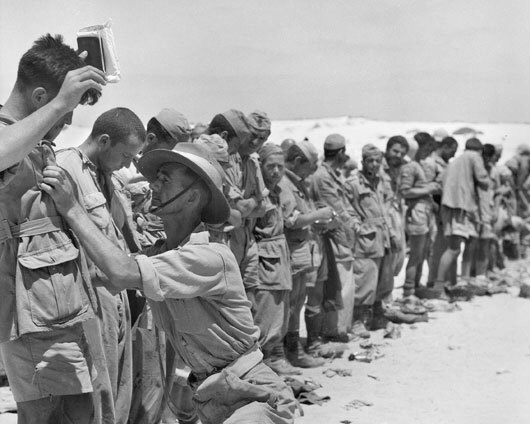 Italian prisoners of war being searched by a provost of the 9th Australian Divisional Provost Company (AWM 024537). 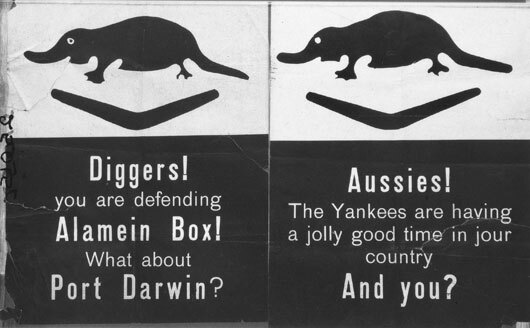 German propaganda leaflets designed especially for Australians serving in the Alamein sector (AWM 025015). Two Australian soldiers help a wounded German following an attack on a German strongpoint at El Alamein (AWM 042075). The Battle of Egypt began at 2140 hours with the heaviest barrage of all the Western Desert campaigns, across a front that stretched more than six miles (AWM 042485). 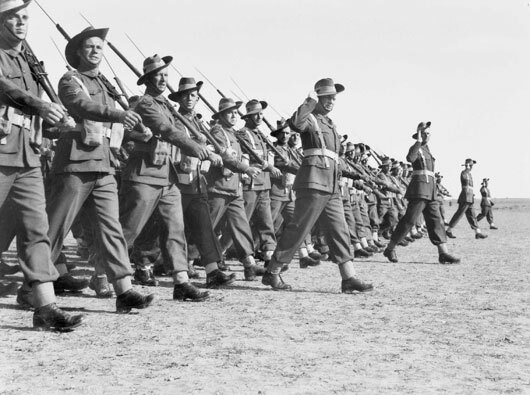 A parade of the entire 9th Australian Division at Gaza airport in December 1942, following the Battle of El Alamein (AWM 050124). 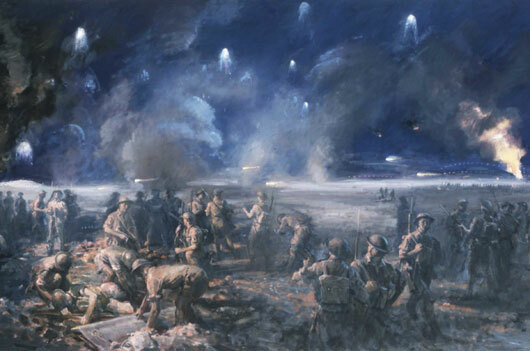 William Dargie, "Attack by 2/24th Battalion, El Alamein at night, 25-26 October 1942" (AWM ART27821).